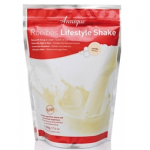 •The shake is in a powdered form and can be mixed with milk or yoghurt to replace meals. It is utterly delicious without the cloying sweetness of other similar products. TIP : Lifestyle shake is suitable for the entire family to use as a multivitamin supplement. Children should use it in addition to meals and not as a meal replacement. Find out more about Annique Lifestyle Shake and ADD (Attention Deficit Hyperactivity Disorder). Each serving provides slow absorbing calcium and milk protein that ensures a sustained release of amino acids that is important for muscle growth and recovery.